I’m not sure how I feel about bathroom attendants. This surprises me because I’m usually head over heals about exceptional customer service, but this maybe crossing the line. 1) I didn’t have the money to give her. I’ve worked jobs that you are very dependent on the tips, so I may be extra sensitive to giving a tip. I just felt very stressed about not having any money to give her. I’ve had this happen in other establishments with bathroom attendants such as restaurants. You’ll have a bathroom attendant standing there with a towel in hand I do everything I can to avoid her because I didn’t bring along cash to use the potty. 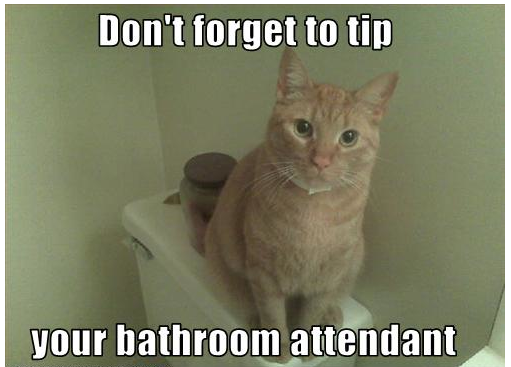 If companies want to have a bathroom attendant it might be a good idea to remove the tip jar and just pay them appropriately. 2) I wanted some privacy in the bathroom. I’m all for giving exceptional customer service but it may be too much in the bathroom or fitting rooms. It seems uncomfortable to me to have someone waiting for you when you leave the stall right after you have dropped a bomb. A clean bathroom with all the supplies would still be consider excellent customer service in my book. Now I do want to emphasize that the bathroom attendant that I encountered in North Carolina was super nice. She was chatting with everyone cheerfully, cleaning up the place, and really was being the best bathroom attendant that you could possibly be. But it still made me uneasy. Anyone else uneasy with bathroom attendants ? « Are you’re guests still talking about how awesome you are?